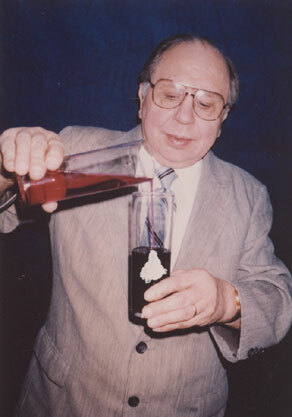 SERMONS IN CHEMISTRY™, DEMONSTRATES "CLEANSING OF SIN BY THE BLOOD"
IN 1947, REV ALLAN BERG FIRST INTRODUCED HIS NOW FAMOUS SERMONS IN CHEMISTRY™ VISUAL OBJECT LESSONS. THEIR USE IN SUNDAY SCHOOLS, CHILDREN'S CHURCH, BIBLE CAMPS AND CLUBS HAVE BEEN INSTRUMENTAL IN THOUSANDS OF CHILDREN COMING TO A KNOWLEDGE OF JESUS CHRIST AS THEIR SAVIOR. 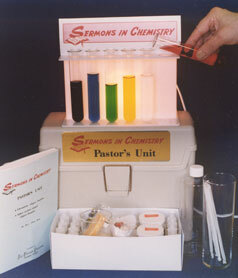 SERMONS IN CHEMISTRY™ STILL TODAY IS A POWERFUL TOOL IN BRINGING SOULS TO CHRIST BY SEEING THE "BLOOD" RED LIQUID COMPLETELY CLEAR THE "SIN" BLACK LIQUID. 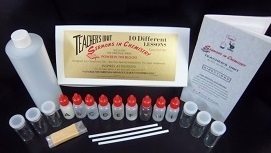 A MUST HAVE TIME-TESTED AND PROVEN TEACHING AID. HAS 45 LESSONS AND INCLUDES ALL THE COLOR CHANGE LESSONS IN THE SMALLER SETS, PLUS A GREAT VARIETY OF STYLE AND KINDS OF OBJECT LESSONS, INCLUDING ACTION -VISUALS. (EXAMPLES INCLUDE: PRIDE BALLOON BLOWS ITSELF UP, SMOKE POURS LIKE WATER, HEARTS CHANGE FROM BLACK TO WHITE, "SIN CORDS BROKEN" ROPE LESSON, TITHING MONEY MYSTERY, DRINKING GLASSES DEFY GRAVITY AND MANY MORE). CARRYING CASE AND MUCH MORE. 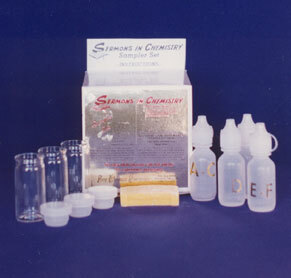 HAS THE SAME 5 LESSONS AS THE SAMPLER SET PLUS 5 ADDITIONAL LESSONS WITH VARIED COLOR CHANGE POSSIBILITIES.